Things don’t get much more glamorous than Los Angeles. The sun-kissed city on America’s West Coast is a wonderland of glitzy bars, glassy skyscrapers and beautiful beaches. “Angelenos” live in world-famous neighbourhoods like Beverly Hills and Hollywood, sandwiched between forested mountains and the Pacific Ocean. 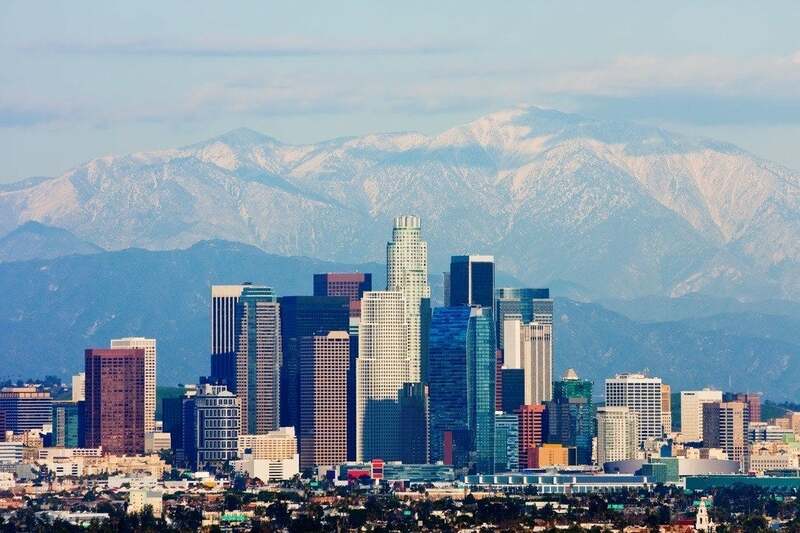 Known affectionately as “The Big Orange”, Los Angeles is the second most populated city in the States with around four million people (The Big Apple is first). It’s also a mega-multicultural powerhouse; the locals share more than 140 nationalities and at least 185 languages. Read on to find out all you need to know about moving to and living in The City of Angels, from shipping costs and visas to climate and culture. It all started in 1781 when just 44 people walked more than one thousand miles north of Mexico to set up a new town. They named it El Pueblo de Nuestra Señora la Reina de los Ángeles de Porciúncula, which translates to “The Town of Our Lady the Queen of the Angels of Porciúncula”. Everyone soon realised that “Los Angeles” was a bit easier to say. Things really blew up over there; in 1850 just under 2,000 people lived there, but by 1950 there were almost 2 million people. Los Angeles has come a very long way. If you’re thinking of moving to L.A. then you’ve probably got a few belongings that you’d like to take with you. Check out the table below for the current average costs of shipping from the UK to Los Angeles. These prices are sourced from WorldFreightRates.com and are based on the port-to-port delivery of a 20ft container of household goods worth £40,000 (or $55,000). Please note: these estimates do not include add-ons such as door-to-door delivery, basic insurance cover and professional packing. Most of our shipping suppliers usually incorporate these services into their prices, so expect some differences between the quotes you receive and the rates provided here. Once you’ve decided to move to L.A., your final hurdle will be getting a visa. There are several different options available, but be aware that the vast majority of US visas require you to have a proper job offer from a licensed US company. There are stacks of great online resources that you can use to look for work in L.A. Websites such as Indeed, Monster, CareerBuilder and Glassdoor all have excellent Los Angeles job boards that are constantly being updated. Plus, the Visa Waiver Program (VWP) allows Brits to visit the US visa-free for up to 90 days. The VWP is a great opportunity to do some proper job-hunting in L.A., enabling you to apply for jobs in person and attend any interviews you might be invited to. You can also get a proper feel for the city and decide if it’s really somewhere you’d like to work. After the VWP expires, you’ll need a proper visa. The US divides them into two categories: ‘immigrant’ and ‘nonimmigrant’, which basically means ‘long term’ and ‘short term’. It all depends on how long you’d like to be an Angeleno for. H1-B Visa / “Skilled Worker”: for people who are professionally qualified in a particular field, typically lasting for three years but extensions to six years are possible. H2-B Visa / “Skilled and Unskilled Workers”: for people who are going to do seasonal work or temporarily fill a labour shortage, typically lasting either one or three years. L-1 Visa / “Intra-Company Transferee”: for people who are moving to the US to work for their current employer, typically lasting for five or seven years. Check out the full USCIS breakdown of employment-based nonimmigrant visas here. E1 First Preference: for people of ‘extraordinary ability’. E2 Second Preference: for professionals holding advanced degrees. E3 Third Preference: for professionals and other skilled workers who have at least two years’ training/experience, or unskilled workers who are filling a labour shortage. Check out the full USCIS breakdown of employment-based immigrant visas here. The Permanent Residence Card – or “Green Card” – allows people to live in the US indefinitely. It’s very rare for someone to receive one without having spent a few years already working in the US on a temporary visa, so you don’t need to start thinking about it yet. For more information, have a read of the USCIS page on Green Cards. Who lives in Los Angeles? We’ve already mentioned how multicultural the Big Orange is. Those 140 nationalities represented by the Angelenos means that ethnic communities have popped up all over the city, ranging from Asian districts like Koreatown, Chinatown and Thai Town to African areas like Little Ethiopia. You won’t be surprised to hear that L.A. has some of the best international food in the whole of the United States. So how is the Los Angeles population broken down? The last official US census was in 2010 (the next one is in 2020), and it revealed that L.A. does not have a majority population. After Hispanic people (49%), the most common ethnicities are White (28%), Asian (11%), African American (9%) and Native American (0.7%). You can see the full census report here. Almost 37% of the Los Angeles population is foreign-born, so as an expat you’ll be in a lot of company. One of the Big Orange’s big draws is undoubtedly its marvellous weather. The climate is mild and sunny pretty much all year round, with warm winters that even the Mediterranean countries feel jealous of. Los Angeles typically experiences about 284 days of sunshine each year, which is way higher than the US-wide average of 205 days. Decent shades are a must over there. The best L.A. weather can be found during spring and autumn, i.e. March to May and September to November, when temperatures generally range between 12°C and 25°C. At this time of year, it’s never too hot or too cold for exploring the city. The city’s hottest weather usually occurs in July, right in the heart of summer, with temperatures regularly hitting 30°C and beyond. Thankfully, a breeze regularly blows in from the Pacific Ocean to make things a little cooler. On the other hand, winter temperatures can drop to around 5-8°C, which is chilly but not unbearable. You won’t be surprised to hear that it barely ever snows there (the last time it snowed in Downtown Los Angeles was 1962). L.A. is still famous for its smog problem, but things are way better than they once were. Back in the 1950s and ‘60s, all the cars used to fill the air with fumes and then the surrounding mountains would trap the dirty air, creating hazy black clouds. However, the cars in L.A. are much cleaner now (thanks to a lot of legislation). Unfortunately, Los Angeles is in a rather unlucky situation. The city is located on top of the San Andreas fault, which means it has to deal with a lot of earthquakes. Most of these are undetectable to human beings, but now and again a big one strikes and it can be fairly destructive. Across the 20th century, Los Angeles experienced three major earthquakes. Naturally, much of the city has been designed to cope with earthquakes, and clever Californians are always trying to predict when the next big one will be. Certain parts of Los Angeles are lovely to walk around, but it’s called the Big Orange for a reason. You can’t really explore the city without using some form of transport. Here are your best options. In Los Angeles, driving is life. Unfortunately, this means traffic jams are life too. According to the American Community Survey of 2017, 70% of L.A. commuters drive to work alone, so there’s a real opportunity for carpooling there. Loads of major roads run through the city, such as Interstate 405, known by cool people as “the 405”. You can use your British driving license to drive a hire car in the US for no more than one year. Los Angeles has one of the best inner-city public transport systems in the US, and yet just 9% of Angelenos take public transport to work. Get more people to swap their car for the subway and L.A. might have less of a smog problem. There are six fast and easy-to-use rail lines running across the city (two subway and four light-rail), plus around 200 bus lines. It’s not cheap to feel poorly over in the States. Apart from Medicaid (for the very poor) and Medicare (for the elderly), you need to pay for health insurance. Most people normally take out a policy through their employer, although this option is usually available only to full-time workers. 2010’s ‘Obamacare’ made it compulsory for nearly everyone to buy some form of health insurance, and if you refuse then you end up having to pay extra tax. Expats in the US are not required to have health insurance, but we think it’s a pretty good idea to get it. As reported by the Centers for Medicare and Medicaid Services (CMS) in 2017, the average American currently spends around $10,345 per year on healthcare. Check out the table below for an idea of how much it costs to live in Los Angeles, based on figures from Numbeo. Bear in mind that the average salary over there (according to Payscale) is $62,558, or £47,629. Los Angeles has famously got a rather expensive property market, but it’s certainly not the worst in the US. In a 2017 study by the National Association of Realtors, L.A. ranked as the 7th most expensive place to buy a home in the States. Meanwhile, San Jose, San Francisco, Anaheim and San Diego (all in California) were 1st, 2nd, 3rd and 5th respectively. California is clearly very pricey but you can do a lot more expensive than Los Angeles. According to Zillow, the current median sale price of homes in L.A. is $699,600, or £530,993. Meanwhile, RentCafe claim that the average rent for a one-bedroom apartment in the city is $2,068 (or £1,570) per month. There’s loads of choice when it comes to choosing a place to live in Los Angeles. Take a look at our guide to L.A.’s best neighbourhoods for expats. The locals in L.A. never get bored. There is so much to do in the city, and obviously all the great weather means that outdoorsy things are fairly high on everybody’s list. Here are some of the coolest places in the City of Angels. L.A. has got a lot of iconic beaches and they each have their own distinct identity. The famous Venice Beach is probably the coolest of the lot, full of arty types and young people on rollerblades, while Malibu Beach is good for celebrity spotting. Laid-back Manhattan Beach is ideal for family visits, and the two-mile-long Santa Monica beach pretty much has it all. 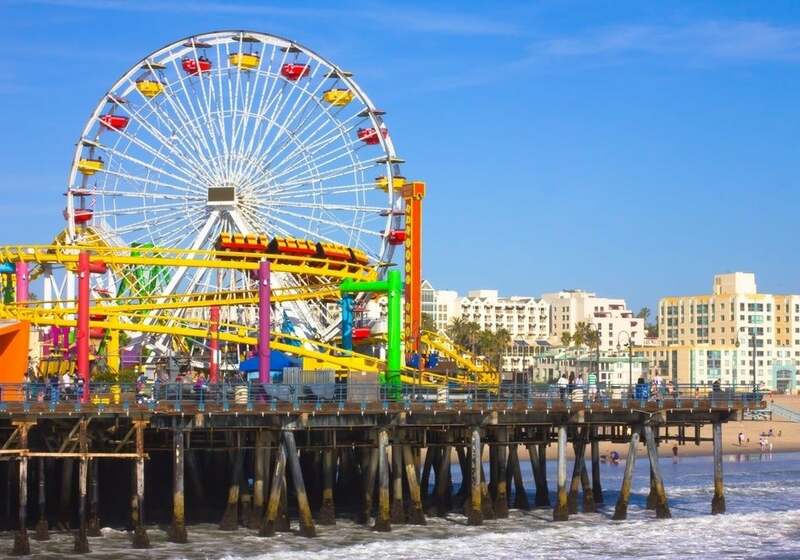 The historic Santa Monica Pier still feels really retro, with the Pacific Park amusement park, an aquarium and a carousel. If you want to ride on the world’s only solar-powered ferris wheel, you’re in the right place. If you want a less sandy escape from L.A.’s urban vibes, there are forested mountains that are figuratively right on your doorstep. With the Santa Monica range to the north and the San Gabriel range to the east, beautiful scenic hikes and bike rides are always an option. Angelenos love to leave the city on the weekends and go for a trek. 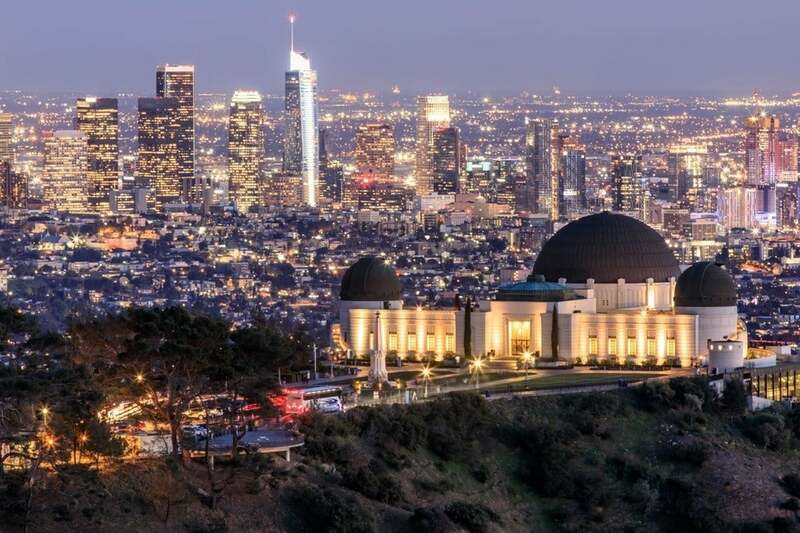 There are also some glorious parks within the city, such as Runyon Canyon Park (just two blocks from Hollywood Boulevard) and the 4,310-acre Griffith Park, home to L.A. Zoo, Griffith Observatory and the world-famous Hollywood Sign. Nowhere in Los Angeles will make you feel more like you’re in a movie than Sunset Boulevard. The 22-mile road goes from the mansions of Hollywood to the classy beaches of Malibu, travelling through Beverly Hills, Bel Air and Brentwood. The highlight is a stretch in West Hollywood known as The Sunset Strip; drive along there and you’ll see a load of famous buildings, from the Whisky A Go Go bar to The Sunset Tower Hotel. Los Angeles is full of superb places to eat, but some are better than others. We’ve shone our spotlight on three of the best sites in the city for yummy international grub. This one hits a lot of birds with one stone. Grand Central Market is a gathering of 37 different food vendors in an indoor marketplace, founded just over a century ago. There’s always an exciting atmosphere, full of sensational smells and multicultural vibes. The food is extremely diverse in there; take one lap of the market and you’ll feel like you’re walking around the globe. Some of our favourite stalls include: Eggslut (excellent eggy breakfasts), Madcapra (superb falafel), Wexler’s Deli (cracking pastrami) and La Tostaderia (wonderful ceviche). Some people say that the best sushi outside of Japan is in Los Angeles, and they might be right. Sushi Gen has become a staple of the L.A. sushi scene, having been founded in 1980 and delighting diners ever since. The fish is always fresh and fairly no-frills, but it’s the reliable simplicity of the whole thing that’s kept Angelenos returning again and again. Get yourself down to Little Tokyo and tuck in to Sushi Gen classics such as steamed clams, sauteed sole, salmon skin salad and monkfish liver. With one of the highest Mexican populations in all of the US, it’s only fitting that L.A. should serve some top-notch Mexican food. Tocaya Organica is probably the best of a great bunch, having popped up in the city only a couple of years ago. Take a short walk inland from Muscle Beach and you’ll find a rustic, wood-coloured restaurant sitting beneath a line of palm trees. People always fall in love with the signature Summer Salad, containing organic strawberries, Marcona almonds, pomegranate seeds, grilled corn, chopping mint, diced cucumber, butter lettuce and strawberry sherry vinaigrette. Wowza! When the sun sets on Los Angeles, funky clubs and glitzy bars get busy. A night out in L.A. is easily one of the best in the States, but you need to make sure you choose the right places. The hipster craft ale scene has engulfed America and Los Angeles has embraced it with open arms. Angel City Brewery was fairly ahead of the game when it began in 1997, and in 2010 it moved to its current site: a West Coast brick warehouse from 1913 that used to manufacture steel cables. Yes, it’s as edgy as it sounds. There are colourful murals and bits of graffiti all over the walls, so it’s really arty but not in an high-brow way. The locally brewed ales are fantastic, although there’s also a wide range of refreshing lagers if you want something a bit less brown and aley. What’s really cool is that you can bring your own food into the bar, so you don’t need to worry about buying unnecessary food. If you fancy something a bit more upmarket than a brewery in a warehouse, the Gatsby-esque chic of No Vacancy ticks all the boxes. After heading through a brilliantly devised secret entrance (we’re not giving anything away), you’ll find yourself in a restored Victorian house. Spanning across three floors, the ornate fireplaces, red leather furniture and dimly-lit rooms create an unforgettable atmosphere. Step out onto the patio at the back and there are tightrope walkers, burlesque dancers and jazz bands. What’s more, the 12-item cocktail menu (known as The Dirty Dozen) is regularly updated by proper mixologists. There is an actual dress code, so don’t come here straight from the beach. For a truly raucous night of piano-led singalongs, get yourself down to Howl at the Moon. The whole concept of the evening is based on a pair of extremely talented pianists, who each sit at their own pianos and ‘duel’ with each other. The band is massive, including a whole host of guitarists, bassists, saxophonists, drummers and singers, and they will perform almost any song request that you throw at them. You’ll be sure to have a fantastic time, but be prepared to leave with a sore throat. Thursdays are particularly popular; beers are just $1. Moving to a new city can be difficult. Check out online expat forums like Internations and ExpatArrivals so you can connect with like-minded people in Los Angeles. Los Angeles: Then and Now by Rosemary Lord (2018) – a beautiful comparison of past and modern-day L.A. through some really nice photography. The 500 Hidden Secrets of Los Angeles by Andrea Richards (2017) – this book explores some of the coolest places in L.A., from beaches and parks to cafes and bars. Top 10: Los Angeles by DK Travel (2017) – an excellent pocket-sized guide that you can bring with you while you’re exploring the city.